Congratulations to Marsha on receiving the Smith Fellowship -- a terminal year fellowship awarded by the McCormick School of Engineering. Congratulations to Justin on the renewal of his Nanoscale Science & Engineering Center (NSEC) Fellowship. Ampika will be attending the upcoming THERMEC' conference and Rick is headed to ICAA. Congratulations to Dr. Keith Knipling on successfully defending his Ph.D. thesis entitled "Development of a Nanoscale Precipitation-Strengthened Creep-Resistant Aluminum Alloy Containing Trialuminide Precipitates." Congratulations to Dr. Marcus Young on successfully defending his Ph.D. thesis entitled "Strain Measurements and Imaging of Metal Matrix Composites using High-Energy X-Rays." 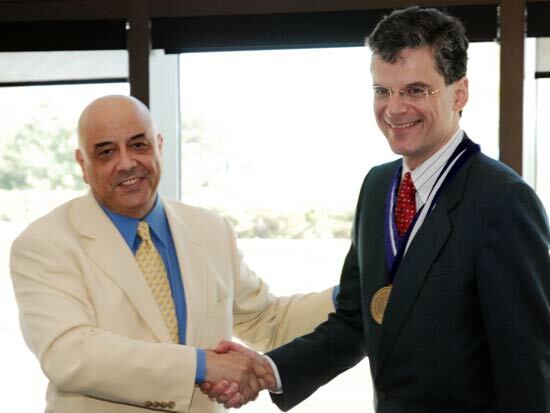 David Dunand is invested as the James and Margie Krebs Professor of Materials Science and Engineering by Dean Ottino from the McCormick school of Engineering at an April 2005 ceremony. The Art Institute of Chicago and McCormick unravel the mysteries of art, an article featured in McCormick By Design. A.H. Brothers, D.W. Prine, and D.C. Dunand. "Acoustic Emissions Analysis of Damage in Amorphous and Crystalline Metal Foams,"
Spoerke, E.D. ; Murray, N.G. ; Li, H.; Brinson, L.C. ; Dunand, D.C.; Stupp, S.I. "A bioactive titanium foam scaffold for bone repair"
"Plasticity and damage in cellular amorphous metals"
Acta Materialia, 53(16) 4427-4440 (2006). "Effects of Ti additions on the nanostructure and creep properties of precipitation-strengthened Al-Sc alloys"
Acta Materialia, 53(15) 4225-4235 (2006). "High strength, low stiffness, porous NiTi with superelastic properties"
Acta Biomaterialia 1(6) 705-716 (2006). Materials Science and Engineering A, 421, 35-39 (2006). Acta Materialia, 54, 6, 1501-1511 (2006). Scripta Materialia, 54, 4, 513-520 (2006). Journal of Materials Research, 21 (6), 1175-1188 (2006). Congratulations to Justin on receiving a prestigious 3-year National Science Foundation Graduate Research Fellowship.